She was born in St. Petersburg, Russia, on February 2, 1905. 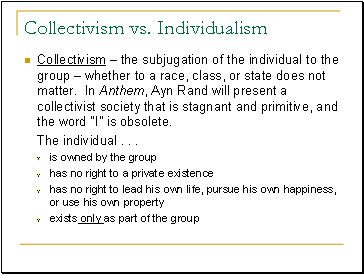 She opposed the mysticism and collectivism of Russian culture. She witnessed both the Kerensky and Bolshevik Revolutions during her teenage years in Russia. The communist victory in Russia resulted in the confiscation of her father's pharmacy and periods of near-starvation for her family. 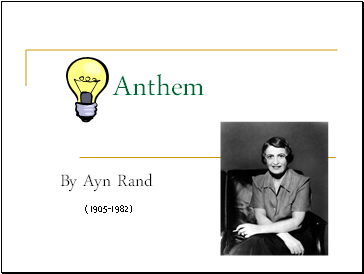 When introduced to American history in her last year of high school, she immediately took America as her model of what a nation of free men could be. 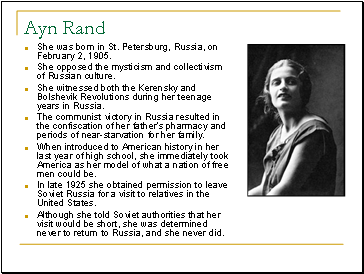 In late 1925 she obtained permission to leave Soviet Russia for a visit to relatives in the United States. Although she told Soviet authorities that her visit would be short, she was determined never to return to Russia, and she never did. 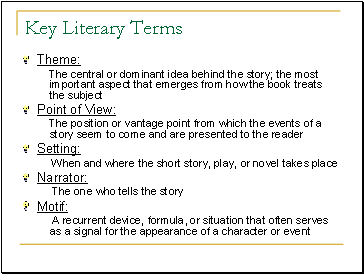 narrator · Equality 7-2521 writes the journal of the events as they transpire over the course of several months. 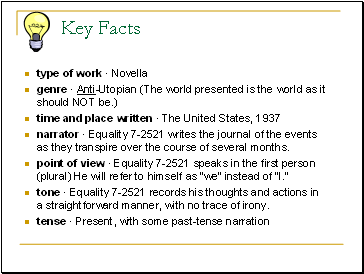 tone · Equality 7-2521 records his thoughts and actions in a straightforward manner, with no trace of irony. 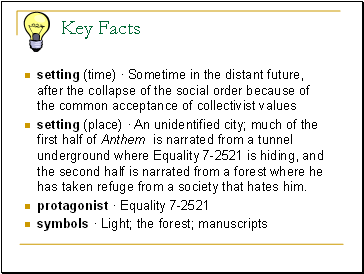 setting (place) · An unidentified city; much of the first half of Anthem is narrated from a tunnel underground where Equality 7-2521 is hiding, and the second half is narrated from a forest where he has taken refuge from a society that hates him.